The SUNY Board of Trustees approved the creation of the University Faculty Senate on October 8, 1953. Article VII of the SUNY Policies of the Board of Trustees states "the Senate shall be the official agency through which the University Faculty engages in the governance of the University. "The Senate shall be concerned with effective educational policies and other professional matters within the University." The University Faculty Senate serves as a resource on governance for the University. It serves as a deliberative body on educational policies for the SUNY System. In this capacity it issues publications such as handbooks, directories, and reports on matters such as budget, program revision, and presidential searches. 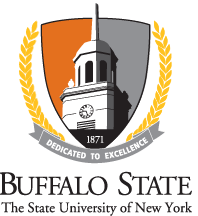 SUNY Buffalo State has two elected University Faculty Senators, each of whom can serve two consecutive three year terms. Faculty and professional staff members may also apply to serve as members of the Standing Committees of the University Faculty Senate: a call for interest appears on the University Faculty Senate Web site each spring. The thrwice times a year plenaries gather Senators from all of the SUNY colleges to meet formally in a three day meeting discussing important SUNY educational topics; inclusive of financial, governemental, and legislative decisions impacting SUNY's Universities, colleges, faculty staff and students throughout their higher educational system.